The cover of the cookbook features Trip. The cover was created by a student in the class who aspires to be a children’s book illustrator. Photo courtesy of Catherine Pangan. Spaghetti or biscuits and gravy? One is his mom’s speciality and served every Christmas. The other, though, is a staple in the Brunk household that is enjoyed on Christmas morning. Meredith Coughlin, on the other hand, has already submitted her recipe: Nana’s bread dressing. Taught to her when she was a little girl, she still cooks it every Thanksgiving, and it doesn’t taste the same anywhere else. Spaghetti, biscuits and gravy, bread dressing — whatever the recipe is, there is some sort of nostalgia attached to it. At least, that’s what Joey Brunk has noticed. “Dawgs Gotta Eat” is a cookbook comprised of recipes submitted by members of the Butler community. The book is a class project created by the students in ED 453 Perspective in Leadership. All the funds raised will go toward Riley Hospital for Children. Education associate professor Catherine Pangan teaches the class. Coughlin, senior organizational communication human leadership major, said the class project helps every individual hone their own leadership skills. Students can take part in many different responsibilities, such as marketing and editing content. She is part of the promotional video team. The cookbook itself is a recipe of big ideas and goals from students in the class. One student wants to connect with others and hear their stories. So, the cookbook also shares the family story behind each recipe. 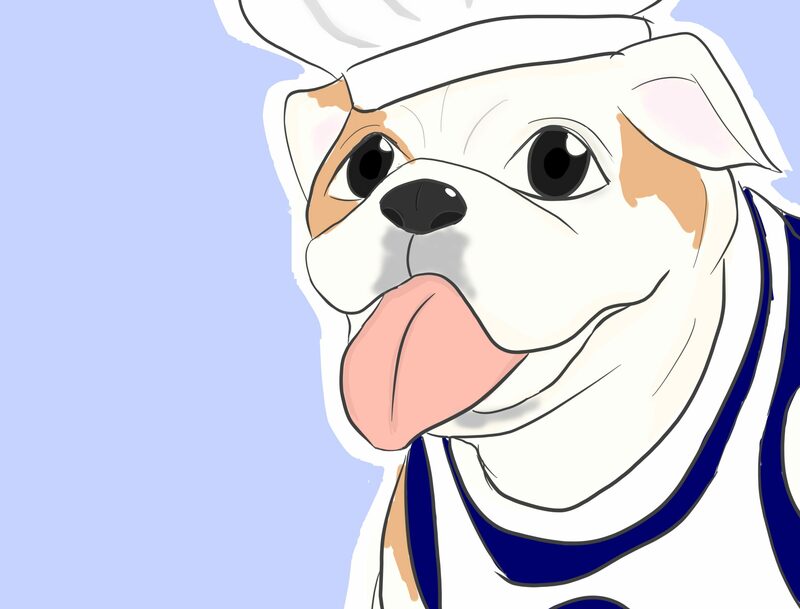 The cookbook’s cover — which features Butler’s main Dawg, Trip — is made by a student who wishes to be a children’s book illustrator. Another student wants to direct a sitcom, so perhaps the promotional video will now have a humorous spin to it. Everyone is being a leader by taking the initiative to send out emails or ask for recipe donations, Brunk said. Just being a part of something bigger than a regular class — working toward making the cookbook rather than a good grade — is leadership in itself. People can submit a variety of different recipes; the cookbook brings people together Brunk said. While first-year psychology major Madison Eden has not submitted a recipe, she thought of her mother’s chocolate chip cookies. Apparently, the trick for a soft and gooey center is Jell-O pudding. Eden does not remember where her mother got the recipe from, but it hits the spot every time. Pangan’s personal favorite recipe is the macaroons from the College of Education’s dean, Ena Shelley. She plans on trying that bread dressing, though. “The whole point of the cookbook is to build community around Butler and highlight aspects of people others may not know about,” Pangan said. Charlotte Hilker, first-year communication sciences and disorders major, said while Butler is not known for its diversity, it would be interesting to see what diverse dishes will be in the cookbook. A vegetarian herself, Hilker said she would also look out for recipes with certain dietary needs. Brunk, a member of the men’s basketball team, said his favorite recipes are from the people he knows personally. LaVall Jordan, men’s basketball head coach, and his wife submitted a recipe for lettuce wraps. Thad Matta ‘90, former basketball head coach and Butler student, also submitted a recipe, and Brunk said he thought it was “pretty cool” that he heard about the project. Brunk’s teammate on the court, Kamar Baldwin, is working on getting a recipe from his mom. People are even submitting dog treat recipes. “We have to have a portion for that,” Brunk said. The class will continue to receive recipes until tomorrow. The book will go on sale Dec. 7 for $10, but pre-orders will also be available. Brunk said in an effort to be more accessible, they will also accept Venmo.